We now have a mailing list of people looking for this unusual animal character. I am looking for a Bah Koo plush toy. It was sold with the sole purpose of helping little kids with nightmares. Bah Koo has an elephant’s snout, cow’s ears, and a lion’s mane and tail. I still have the book that I bought for my children in 1987. I was cleaning out the garage several years ago and inadvertently picked up the wrong bag of stuffed animals and took them to a shelter in Van Nuys, California. It had our most treasured stuffed animals including Bah Koo. I tried calling the shelter but they told me they didn’t have it and would have given their “leftovers” to Salvation Army. I have been trying to find it ever since. I’d love two, (one for each of my kids) but not to be greedy, I’d take one if that’s all I can find. If anyone knows of one or two for sale, please contact me. Hi! I am sorry I do not have one (or two) of these, but the following might be helpful in looking for it. 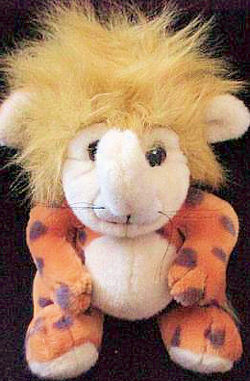 The actual name of this stuffed chimera from the late 1980s-early 1990s was Baka Baku. The baku is the traditional devourer of nightmares in Japanese folklore. I know all this because my son (graduating this month froom college) still has his Baka Baku and, back in about 1993-4, we did some research on this elephant-lion to “be sure” he was up to the job of eating nightmares. (He was.) Good luck with your search! Thanks, Cindy. I shared your comment with the mailing list. Here’s another picture of one. It looks “different”. Yes, this “diffferent” one is the Baka Baku made by Mary Meyer — also from the late 80s-early 90s, beautifully-made, and sadly discontinued. This is actually the one my grown son had (has). Thanks for the photo and the brand of this Mary Meyer version, Tsubomi and Cindy. I’ve copied the photo to my files in case anyone ever asks for that one. I didn’t even know it existed! ebay #170886988611 book and plush set bid item. Thanks, Carrie. This one had already been sent to the mailing list. Here’s one on Ebay, altho it’s ridiculously expensive…sorry. Thanks, Peggy! I’ve sent the link to the mailing list. I am also looking for one for my great grandaughter who is having nitemares. Her mother had one years ago and it worked amazingly. I wanted to leave you my updated email address. I thought I had, but I’m not sure – so here it is. I am still looking for Bah Koo so please keep me in the loop.